This game, together with the similar Tick Tock was William Bryan's take on the three reel gambling machine, redesigned to find favour in British arcades by avoiding classification with the American gaming machines. The three spinning reels are replaced by four keys which swing to and fro. The red key must land over a keyhole for a win. Each subsequent key landing over a keyhole multiplies the payout, with all four taking the 'hidden treasure' jackpot. A door slides open during play to reveal the treasure chest's contents. Because all four keys stop simultaneously, some of the psychological tease of the three reeler is lost. 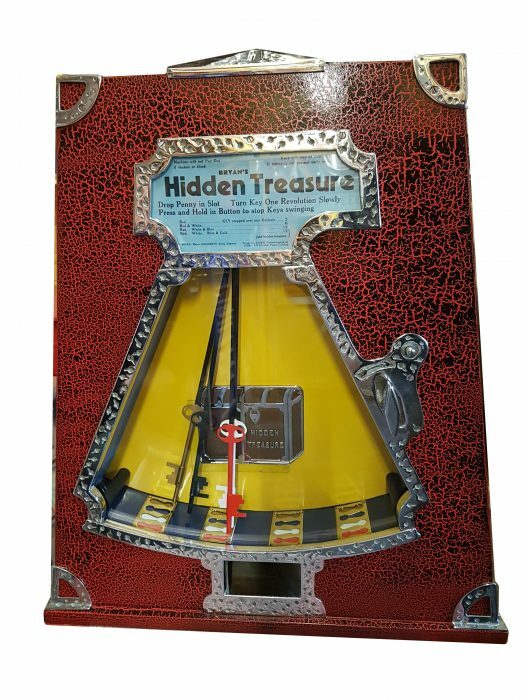 In common with several gaming machines of its period, the Hidden Treasure uses an air valve timer to achieve silent game play. This was considered another way of not attracting attention from the authorities. In practice these timers were unreliable, being affected by temperature, humidity etc. and the lack of sound was unappealing to players. Like most British attempts to reinvent the one arm bandit, it met with very limited success.